Earlier this week, School Library Journal published a list of the top 100 Children's Novels. And at many up-to-the-minute blogs, such as A Year of Reading, you can see this list and get cracking on your own reading or share the list with your students and encourage them to add to their own "life list" of classic books. Students might even highlight and keep track of the books they've read in their writer's notebooks. Librarians may wish to pull and display these books too, introducing children to new and old favorites. who is a true friend and a good writer. I read Charlotte's Web to our children when our eldest was five and our youngest was two. Telling this to a friend years later, she said, "I could not read that book to my children. It is too sad." I thought and replied, "But someday your own mother, their grandmother, will die. Grieving Charlotte in a safe story-place will prepare your children for that true and real-life sadness." Books teach. Books heal. And tears borne through books are beautiful tears, proof of the mighty power of words. Tomorrow begins TV Turn-Off Week, April 19-25, 2010. Children in America spend several hours each day attached to screens. Throughout the upcoming week, each daily (NaPoWriMo) poem will focus on something to do besides watching television. Teachers, please feel free to use these poems to help your students find alternative ways to spend their after-school hours this week. And if they do...I welcome them to comment (through you!) here. Hi Amy. 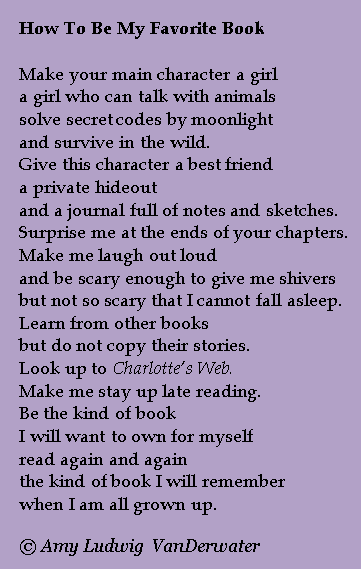 Thanks for this powerful and simple poem about books connecting you to life. I love your site and the good work you are doing. So powerful. So true: "...tears heal/broken hearts." Okay, okay...I'll read it to my kiddos too! I have long loved the ending line too. Great stuff, Amy! You are so gifted! Thank you, Melinda! We should have Charlotte's Web book club...for grown ups!